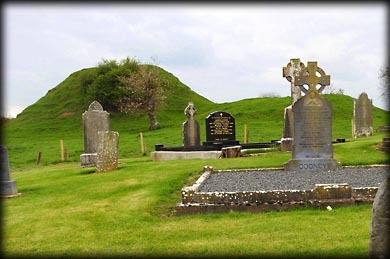 The Norman motte and Bailey at Kilbeg is none of the finest examples I have seen in the Republic of Ireland. It situated along the remains of an esker, a sand and gravel ridge deposited by a glacial stream. The motte, which stands 12 metres high, is connected to a large bailey at the north-east by a causeway. The sub-circular grass covered mound is 48 metres in diameter at the base. 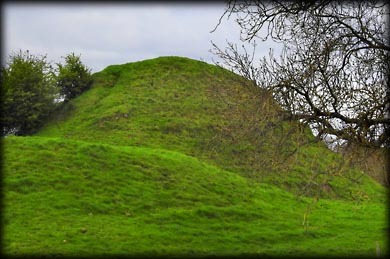 There is a really stunning view of the motte, when approached in early morning light from the Kells Road. Situated: From Kells head NE on the N52 after 4.8 kilometres, take a slight left for Nobber. Then take the next right. The motte is about 1.5K down here next to Kilbeg Upper graveyard. Discovery Map 35: N 7754 8181. Last visit Apr 2017.